🎧 We have finished the Sony MDR-EX650AP review, a budget Sony headphone with a huge 12mm dynamic driver, neodymium magnets and heavy duty brass construction. We have reviewed many other Sony headphones like the Sony MH1 LiveSound, Sony MDR-XB50AP , Sony MDR-EX800st , Sony MDR-EX15LP and there are many shared specs among these models and the Sony MDR-EX650AP which features neodymium magnets and very large dynamic drivers (12 mm to be more specific). Some other tech specs of the Sony MDR-EX650AP include a very broad frequency response of 5-28000Hz, a sensitivity of 107dB/mW and a maximum power capacity of 100mW. 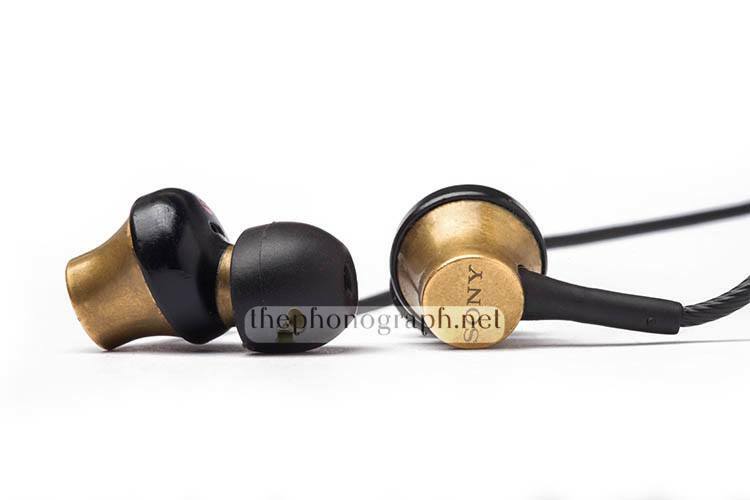 The Sony MDR-EX650AP durability is solid with their highly robust brass housings but also combines some plastic sections with it to maintain a fairly light overall weight. The nozzles are angled to provide a deeper and tighter fit. The cables are well built and have a textured rubberized finish which add anti-tangling capabilities and also give them a better strain resistance and, supposedly, reduced friction microphonics than a standard cable. The 3.5mm plug has a 90 degree angle and a top metal plate that shares the same design, color and finish of the earpieces. The Sony MDR-EX650AP has an inline microphone and a 1-button remote control that allows you to skip songs, answer/reject calls and even control volume if customized with their Android app; you can read more about the button customization app later on this review. The Sony MDR-EX650 can be purchased with or without an inline microphone, an useful info: Sony labels as “Sony MDR-EX650AP” to the model that includes the inline microphone/1-button control and calls “Sony MDR-EX650” to the version without mic/control; the mic-less version usually is found at a slightly lower price. The Sony MDR-EX650AP is compatible with Android and Apple devices. Sony MDR-EX650AP weight in Ounces and Sony MDR-EX650AP weight in grams. The Sony MDR-EX650AP unboxing results in a total of 4 pair of silicone eartips, a cable winder and a soft carrying pouch which is very well built. The packaging is a mediumly sized box with a transparent plastic front cover. The 12mm dynamic drivers and strong neodymium magnets plus the bass performances that we have seen during our reviews of other Sony headphones with similar specs sets the field for a positive bass forecast. During our soundtests and right out of the box the Sony MDR-EX650AP showed an exceptional bass response with strong mid-bass punch and very deep sub-bass. These earphones will never lack bass and will be able to provide an ultra fun bass response. No music genre will demand more bass than what the Sony MDR-EX650AP can provide. Applying an EQ there is a crazy amount of added punch and depth, surely not something that they needed but this EQ bump will make them even basshead worthy. Do not expect a rumble and impact as what can be achieved by amplifying but do feel safe that they will respond with an outstanding unamped performance like few ones can reach. When putting the Sony MDR-EX650AP through out our extreme basshead tests they handled 55% of the maximum power coming from a Fiio E12 amplifier while being set to high gain and bass boost turned on; a custom made basshead EQ was applied. These tests made them accomplish a massive increment of mid-bass punch and sub-bass depth with a basshead impact and rumble way above the KZ ATE, Xiaomi Mi Pro HD or KZ ZS6, substantially above the Monoprice 8320, Vots QT100, KZ ZS2 , Elecom EHP-CA3580 or Xiaomi Mi In-Ear Headphones Pro and similar to the level provided by the Plextone X41M, and Senfer 4in1 but still were unable to dethrone the Sony MDR-EX800st and it’s humongous 16mm dynamic driver. The Sony MDR-EX650AP mids have warm lower vocals but do not sound laid back nor distant despite some mid-bass bleed. Lower mids sound nice and smooth overall and higher mids are well resolved while not sounding harsh or fatiguing. With an EQ lower mids and lower vocals sound clearer and mid-bass bleed is reduced, higher mids sound crispier but can become a bit harshy at times. The Sony MDR-EX650AP has highs with enough brightness and detail, normal listeners will be satisfied by their amount of detail and brightness. On the other hand, piercing highs peaks could be felt if ultra high pitch notes show up (like a very strong piccolo note). Hints of sibilance are present but nothing too uncomfortable (weight your sibilance tolerance, though). An EQ adds a huge amount of brightness and added detail while sibilance and piercing highs become a bit stronger but, once again, nothing terrible. The sound that leaks out of these Sony earphones is inline with most average earphones. They might not be the best choice for library usage but are absolutely usable in normal situations. Noise isolation is effective and slightly better than most average earphones. When moderate to low levels of volume are set the Sony MDR-EX650AP will still provide a noticeable level of isolation. The angled nozzles, small footprint and solid construction result in stupendous comfort that allows extra long listening sessions without a single pain or discomfort issue. The response to almost every custom EQ that we applied was highly effective and presented important improvements with minor cons. Bass gained an astonishing amount of mid-bass punch and sub-bass depth that can make any basshead happy. Mids cleared up substantially and reduced mid-bass bleed with a small introduction of harhsy peaks at times. Highs obtained an important quantity of detail and brightness with a bit stronger piercing highs and sibilance presence. The Sony MDR-EX650AP are outstanding and affordable in-ear headphones with high-class specs like: huge 12mm dynamic drivers, neodymium magnets and brass construction. The overall performance was great in every audio frequency as well as their comfort, response to EQ and build materials quality. With their strong and fun bass full of punch and depth they have obtained a safe place in our Best Fun Sounding Headphones Chart and due to their high impact and rumble presented during our extreme basshead tests they are now placed in our Best Basshead Headphones Chart. The Sony MDR-EX650AP are fantastic in-ear headphones that can be safely recommended to anybody looking for a great sounding earphone at an affordable price. Even more, people that enjoy fun and energetic bass will love the Sony MDR-EX650AP.